Quora is a good place to give me food for thought. 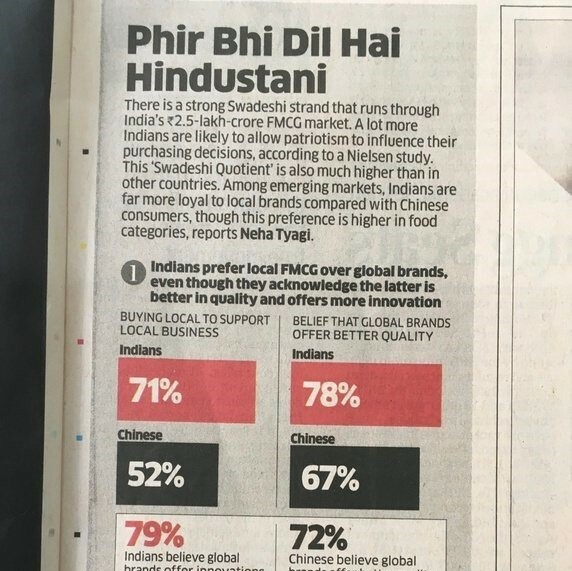 Other day someone asked “Can Local Brands Challenge MNC Brands in India?” The question was in the context of Burger brand. I don’t see any reasons that why a home grown local (Indian) brand can’t succeed. There are plenty of Indian brands in various product categories which are giving tough times to MNC brands in various product categories. Virtually in each product segment such as automobiles, grocery, technology, textiles or mobiles etc. ; there are enough examples of successful home grown brands. places. But why no local burger brand could get any recognition? McDonald’s business model has various components contributing to their success. To name few – sourcing, retailing model, quality, uniformity, environment, service and customer delight etc. So if anyone who can crack their model with equal or better consistency of product offerings, I don’t see any reason one will not succeed though it might be uphill task to do so. Below article of Economic Times is evidence of the same. Experiences of Indian professional and expert, who's heart lives in rural India. Read his views on Career Personality Development, Business, Advertising, Sales, Marketing, Technology, Social Media and Life. How to make my website appear in Google Home or Alexa Voice Search?